Following consultation with a number of top companies, the Insights Group recognised that increasing agility was one of the top ten problems they faced. Universities Human Resources defines organisational agility as the ability to manage continuous, rapid and sustainable change. In an article published in McKinsey Quarterly, Aghina, De Smet, and Weerda suggest that an agilecompany is both stable and dynamic. While this may seem like an irreconcilable paradox, these two elements are both essential to creating an agile business. A company that is constantly fluid and adaptive, but has poor operational processes could quickly find itself exceeding budgets or leaving itself open to legal challenges. One American home cleaning startup originally gained $40 million in investment in 2013, but closed down after just 2 years of operations. Having expanded quickly into US and international markets, the company failed to secure repeat business and faced a number of lawsuits from workers after it was ruled that they were misclassified as independent contractors rather than employees. On the other hand, a corporation that is rigid and unchanging will quickly be left behind in a marketplace of innovative enterprises. The classic example of this is Blockbuster. Anyone of my generation will remember the thrill of stepping into a Blockbuster store and seeing the seemingly endless rows of videos/DVDs displayed in all their glory. However, they’ll probably also remember the late fees! And if you lived in a town or village without a film rental store, what then? In the late 1990s, Netflix set up an online DVD rental and sale site, rapidly followed by a subscription service offering unlimited rentals. By 2007, Netflix enabled users to stream films and TV series in their own homes and is now available worldwide and had expanded into producing original films and series. In January 2013, Blockbuster went into administration and its remaining 91 UK stores closed their doors for the final time in December of the same year. Individuals that lead with Sunshine Yellow energy are good at continually encouraging exciting new initiatives, which is a important element of responding to an ever-changing business environment. They may, however, need to consciously focus on working with their Cool Blue energy to help them to be more consistent to establish and manage effective systems and processes. These processes provide a stable organisational foundation, as well as a framework within which a team member that leads with Fiery Red energy, likely to be proactive and keen to deliver results quickly, can trial new initiatives and test for viability. By dialing up their Earth Green energy, this will also help them to learn from others and to provide guidance and direction for individuals that lead with Sunshine Yellow energy to once again develop new initiatives. By being aware of the colour energies that you are strong in and those that your colleagues lead with, it enables you to maintain the balance between dynamism and stability. 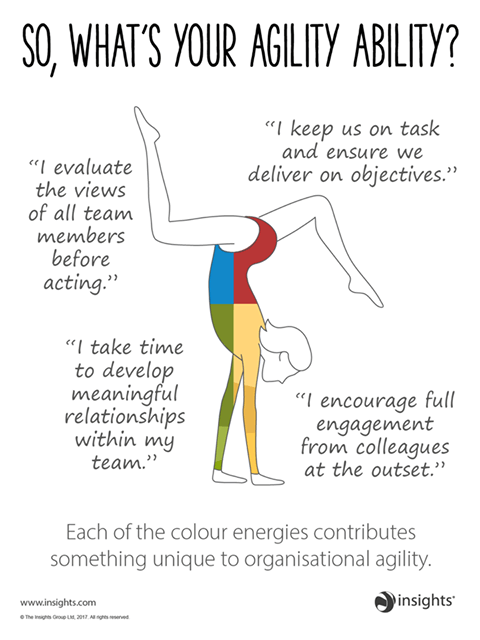 The four colour energies working together create a company that is adaptive, resilient and reliable. Performance – Workplace Development is a Licensed Distributor for Insights Discovery®. Need to know more? Check out our Insights Discovery® page for ways in which we could help you.